Oh boy I can't wait to bomb some dodongos on this map! Its looking great isn´t it? I´m having so much fun doing this!!! I´ve worked on it more. Turning out great!! I need the other houses, the temple and the shipyard. I know!! Im trying my best and doind some work at this when I get time. Definitely refreshing to see something from PH. Though there are some tilling errors near the bridge/waterfall and the entrance to the town. where? I can´t see them... im working on it now so I can fix it right away. EDIT 2: the one on the path way is also fixed. just not in the picture. Do you have a spritesheet of any kind for that water? It looks fantastic! the water is from kingmob´s shadowgazer, Leduardo used it for his Isle of Frost, I am using it because I want not only to make this island, but ALL the slands and put the together on one huge map. 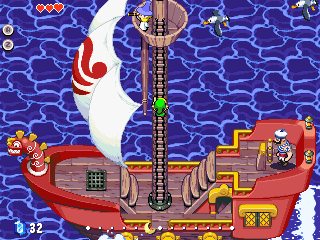 Actually I think those are two sets of tiles, one overlaps the other, achieving the effect seen in Wind Waker. It is almost done!! I have to finish the outline of the island, put some trees and bushes, and place the temple, the house of the left of the island and the shipyard (I need help with those, please) and the small island on the top right. The diagonal cliffs are not in the actual game, I made them. what do you thing of the dock way now? Better? -Put bushes and trees around the empty spaces of the island. Also tell me what you guys think od the temple, is it ok? I think it looks great!! The next one is the final one!! All I need is the Shipyard (feedle´s purple buckets also.) and its finished!! But for now, I will move to something else, something you will enjoy aswell. Its a very good work. I just simplify the amount of mountain layers at the top. That would make the map cleaner. I used his temple as a basis to create something more like the original game. The temple is not finished. The shadows need to be better worked, as well as some textures. I believe that you can improve.